At the Foundry in Plano, Texas, interns are often given very simple instructions: "Here's a problem. Solve it." Nancy Dominguez took it a step further. Nancy went to her supervisor and said, "I see a problem and I want to solve it." Like many of us, Nancy saw too many stories this past summer about kids and pets left in hot cars. She decided to take action. As a mechanical engineering major at the University of Texas at Dallas, Nancy had the basics figured out: a sensor that would send an alert. With help from the team at the Foundry, Nancy's design is becoming reality. A prototype is in the works and Nancy has been doing much of the work herself. "When the idea first popped into my head, I sent an email explaining the idea," Nancy said. "I didn't expect them to say, 'I like that. Let's start working on it.'" Nancy was born in Mexico, but has been in the United States for over 15 years. A Foundry initiative to find diverse talent from international or disadvantaged students made sure that Nancy didn't fall through the cracks. Eddie Schutter, Director of New Technology Product Engineering, thinks AT&T is the lucky one. "Nancy might not have been picked up in a traditional internship program, which would have been a tragedy for us," Eddie said. "At the Foundry, it's not just skill and capability that we're looking for, but a person with passion, willing to take risks and try things outside of what they usually do. Nancy did a lot of the programming and electronics and had never done those things before." 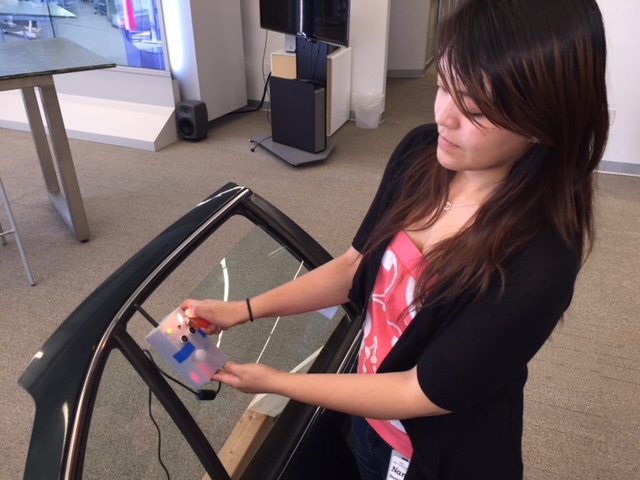 Here's how her idea works: Sensors in the car use motion detectors and monitor carbon dioxide levels to determine whether there is a person or animal inside. You would receive a text message letting you know that someone is in your vehicle. Nancy expected that her AT&T internship experience would be more than fetching coffee and job shadowing, but actually creating a product goes beyond her hopes. She says her time with the company has been inspirational. At first, being in school, I felt like it would be very hard to do anything like this until I was a lot older. It seemed kind of bleak to be able to affect people's lives. When I saw I could get that kind of support here, it was a real confidence-booster. It helped me to realize that I can do whatever I want if I set my mind to it. Nancy is currently back in school. She'll graduate this summer, and even though her internship has ended, she still goes back to the Foundry from time to time to check in on her project. She even rolls up her sleeves and does a little work. Principal Developer Michael Albrecht takes notice. "I'm excited to continue working with Nancy," he said. "She's a very bright young lady and if we can snag her for the company – get her working for us – the next generation of employees is looking very bright for AT&T." "That would be cool," Nancy said. You know what else is cool? Helping to save lives while many of your classmates are waiting tables, making copies or stocking shelves. What could you do with your summer vacation? See how you can shape the future and learn more about internships at AT&T.